The Japanese word “Setsunasa”, which I Am Setsuna derives its thematic thrust from, is a nuanced one, and it’s a word that doesn’t really translate into English as neatly as some might try to force it to. In literal terms it means something close to “sorrow,” but in practice there’s a weight of Japanese culture that deepens the word, so that it has more gravitas than that. 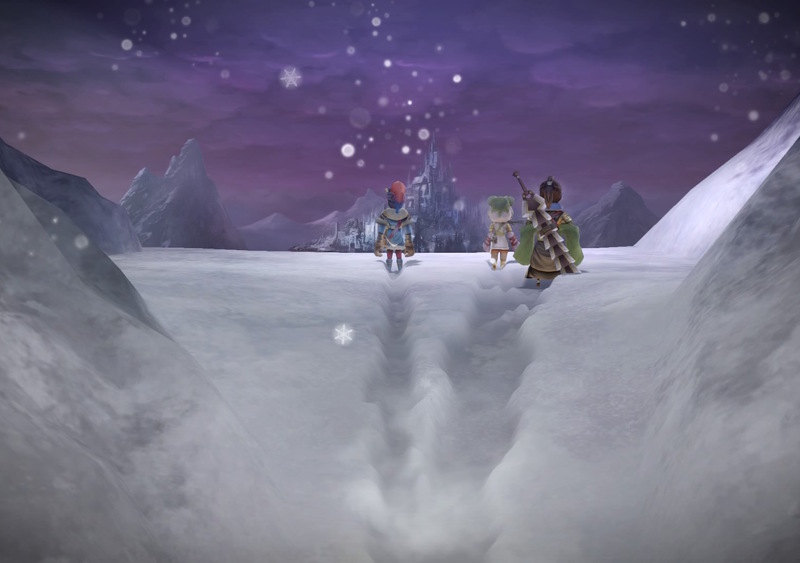 Setsuna is a nostalgic melancholia; a highly emotive word about time lost, and even regret. 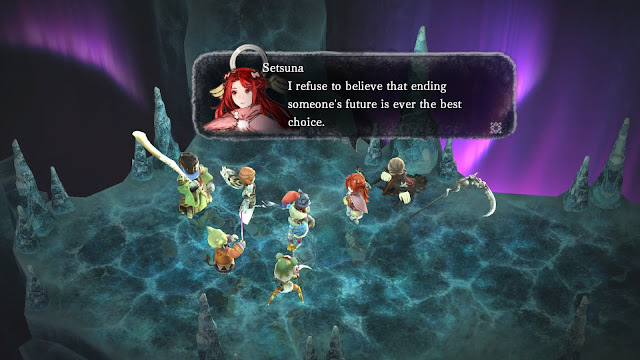 “Setsuna”, meanwhile, means “a moment in time,” and formed the core theme for the game’s battle system. 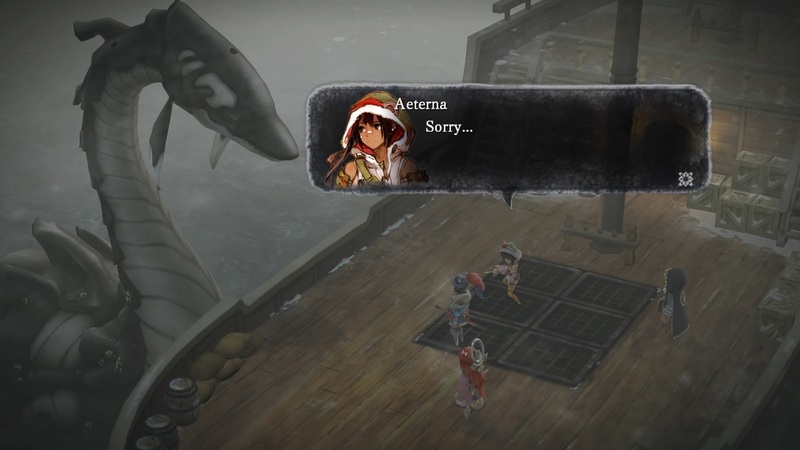 Brought together, I Am Setsuna works in both a narrative and a meta sense; it is a profoundly moving story about a girl destined to be a sacrifice… and it’s almost a sorrowful dirge for what we have lost from the JRPG genre in recent years. 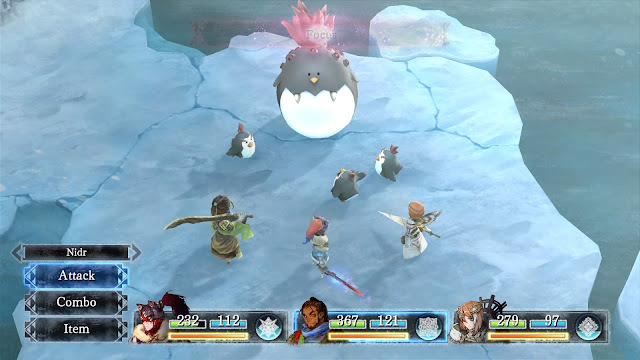 I Am Setsuna stars a mostly silent protagonist, who happens to be a mercenary, and at the start, he is given the task of assassinating a girl called Setsuna. On arrival at the girl’s village, however, he realises that he can’t go through with it, but that doesn’t matter ultimately, because the girl is designated as a sacrifice that will die soon enough anyway. In order to ensure that she does so, our masked protagonist actually signs up to be her guard and guide, and, accompanied with some equally flawed ‘heroes’, they set out on their quest together. If all that sounds like a dark take on the core plot of Final Fantasy X, it’s because it is. I Am Setsuna does not hold back on its exploration of the darker side of morality. On their journey, the band of heroes encounter all kinds of twisted ideologies and nastiness done in the name under the auspices of being for ‘the greater good’. Square Enix has requested that I don’t spoil the narrative, and I won’t, because like all good stories it should be experienced first hand, but what I can say is that the narrative takes players through a series of vignettes, in a structure similar to Dragon Quest. Players will come to a town, complete a quest that the locals set them, before being driven on to the next location and quest. In other instances, the stories are stories of tragedy manifest as deep melancholia. Characters – especially the heroes, all grapple with their own demons, and their own personal experiences of loss. Their efforts to make good cause them to do risky, dangerous, or life-threatening things, but these are things they do willingly with the end-goal in sight; the completion of the sacrifice’s mission. Without giving too much away, Setsuna’s quest begins because the monsters have become aggressive enough to risk human settlements. When that happens, that generation’s sacrifice needs to take herself to the furthest reaches of the world, and in her death the monsters are pacified enough that they will no longer threaten humans. As the power of the sacrifice wanes, the attacks will start to pick up again, and a new sacrifice is needed. Setsuna, through her quest, therefore represents a spiritual hope and liberation, in a world incredibly hostile to these things. This game is utterly relentless with its themes. Reinforced by a hauntingly beautiful piano soundtrack, and the endless white of a world perpetually enclosed in the cold of a frozen north, every step on this particular journey is fought with a rhythm of heavy emotion and that sad nostalgia that gives the game its name. Every step of the way you’ll believe you are getting a step closer to the death of Setsuna, and, where in Final Fantasy X I believed from start to finish that Yuna would survive (because it was clearly one of those stories where innocence and “goodness” would win the day), not once in I Am Setsuna did I feel like I was on anything but a death march for one of the few symbols of a true “goodness” in the world. It became quite affecting, and, as the game wore on, I found I could play it for shorter and shorter sessions. 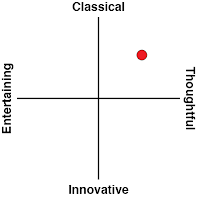 Not because I found the game tiresome or frustrating, but simply because it was crushing, impactful, and consistently meaningful to me. Once again I can’t say much more about the narrative – and I would like to, so once it’s safe to go into spoilers I’ll do a follow up analysis piece on the narrative – but suffice to say it is powerful stuff. 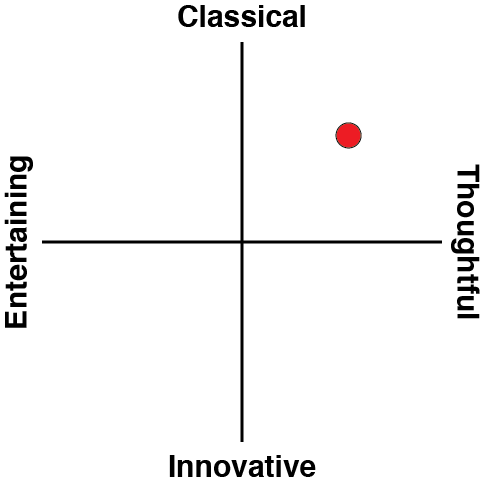 The game is, mechanically, a flight to nostalgia in its own right, being very traditional in its execution. You’ll take three heroes into battle, and, as with the JRPGs of old, you’ll have limited room with which to customise them as they level up. Instead, you’re expected to make good within the confines of what the game prescribes to the characters. Setsuna will always be focused on supporting her allies and healing them, while the little boy character will always be the mage. The guy with the big sword will be the one who can wound groups of enemies with each swing, and the one with the lance is the one with the Jump command (yes, that’s a clear nod for Final Fantasy fans). When battle is joined, you’ll square off in a turn-based system that uses an ATB system like the Final Fantasy games of old. You’ll wait for a bar to fill up, and then select an attack, and then your enemies will get their turn. Some enemies are faster than others and, especially with bosses, you’ll want to use magic abilities to slow their attack rates down if you can. One dash of innovation to those old systems can be found in the game giving you a reason to hold off on attacking after the ATB bar is full. By waiting, a second bar starts to fill up as well, and, once filled, awards the character with a “point.” Up to three points can be stored by allowing the meter to fill. These points can then be expended to boost the strength of attacks or healing spells, or perhaps allow for the use of abilities more frequently. 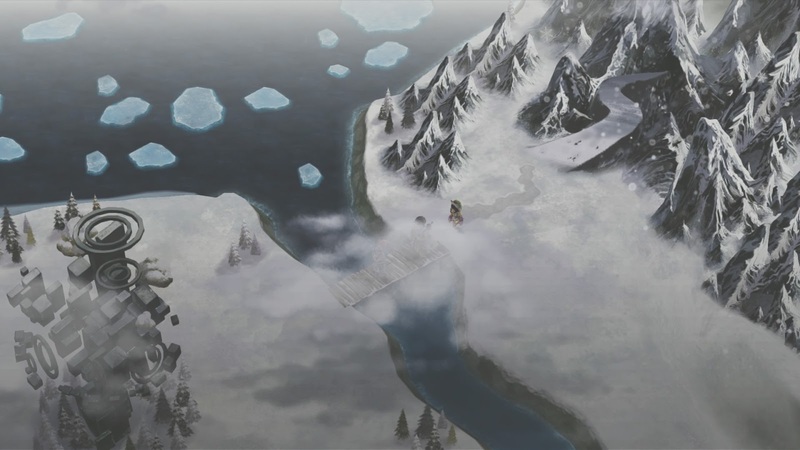 The impact that these points have can make the difference between an easy encounter and a brutal one, so knowing when to make use of them is key to the strategy of I Am Setsuna. Aside from that system, the game is perfectly quaint in its adherence to tradition. You’ll fight a small range of enemies throughout the game, though more powerful versions will be coloured differently – the once-dreaded “palette swap” of old JRPGs that manages to be thoroughly enjoyable and thematically appropriate here. For all the relentless sorrow of the game’s narrative, these enemies are also adorable. From cranky little penguins through to two tailed squirrel characters that do a handstand on a rolling ball of snow in order to protect themselves from danger, it is in the enemy design that there is some relief from the otherwise intense narrative. What really impressed me about I Am Setsuna is the way that the various systems layered on top of one another to reinforce and complement the intense, powerful themes that sit at the core of the game. This game, which is about sorrow, provides us with a mournful look at humanity and yet also gives us hope that there is good in people, even in the darkest of times. The game itself is a nostalgic hymn for so much of what we’ve lost in the JRPG genre as it pushes ever closer to visceral action. Wrapped together they make for one of the most heartfelt and meaningful games that you’ll play for quite some time to come, and it’s almost frightening to imagine that, if work this mature and refined is what such a rookie developer can achieve, just how high will Tokyo RPG Factory’s star rise?